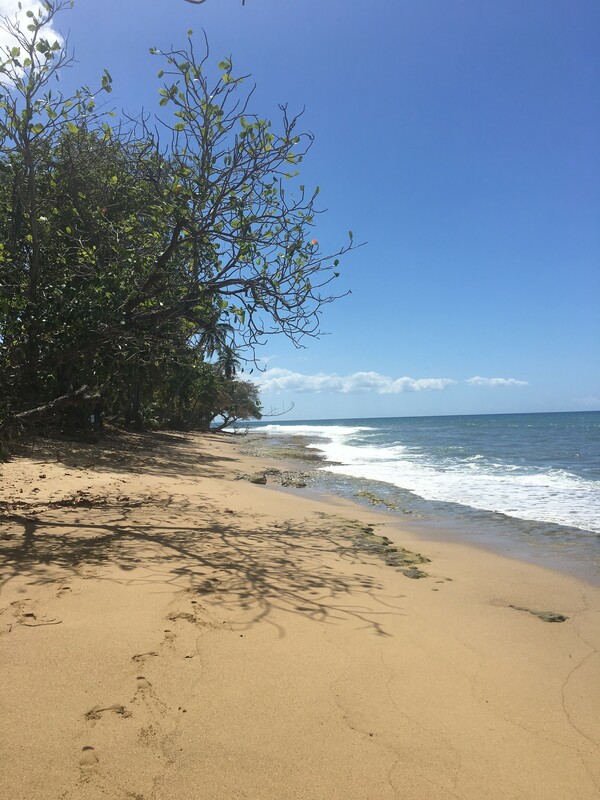 My wife and I have been traveling to the Northwest corner of Puerto Rico for more than twenty years. First as part of our courtship — her mother is from a small town on the Southern coast of Puerto Rico, so I was taken to meet the extended family. We all squeezed into a tiny beach house rental at a beautiful beach. Unable to speak any Spanish, I remember building a sea serpent in the sand with two of my wife’s younger cousins. Before that trip I had never been to the Western part of Puerto Rico. I had been to the Eastern part, and the Rain Forest, staying in hotels with my family. 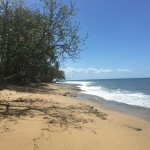 But after that first trip, my mother-in-law built a house on a tiny piece of land on another beach in the town of Rincon (Spanish for corner), near where an old friend of hers had also built a house. The town is both a world famous surfing location and a favorite vacation spot for Puerto Ricans. We came every year after that and brought our daughters and, spent many years alternating between splashing with them in the natural puddle created by reef right in front of the house and collapsing on the porch. If you could see this porch, you would understand. There is a hammock and the ocean roars less than one hundred feet away and there is nothing better for soothing harried New York City nerves. Popping up is a crucial part of learning to surf. You do it just after you’re launched on the wave by springing up from lying on your stomach to a kind of sideways crouch. If you do it right, you are at that moment in command of your board and the wave. There are, I can attest, many, many ways to do it wrong. Out in the water, Nina got popping up quickly. Not me. As I tried to get up, I kept leaning on the back of the board instead of putting my weight forward (unknowingly putting on the brakes when I should have been pressing on the gas). My teacher, ever the optimist, blamed bad waves. “Papi, this is not your wave,” he kept saying, with increasing frequency. Finally he began suggesting interesting local attractions (on land) I might want to visit. Nina was done — she’d conquered surfing. But I hadn’t and wasn’t. I didn’t want to give up. I am a writer and used to rejection. I have published short stories, journalism, and have been working for years on a novel, about which I like to employ the refrigerator magnet/ Churchill maxim: “Never, ever, ever give up.” So surfing, another impossible endeavor that promised years of work before experiencing small successes? Right up my alley. I went out and bought an $11 T-shirt with a surfer and “Dogman’s Beach” written across it as my aspirational goal. On our next visit, I signed up for a class and was paired for some reason with a seven-year-old boy who looked like he had been born on a surfboard. I remember coming very close to standing up on one run, but falling off on purpose when I realized my success might lead to his dismembering: he was coming straight across my path. After that run, I remember stumbling to the shore, and lying on the ground next to my board trying to look as if the whole thing had been intentional — even fun. A woman came over who had been watching from the beach with her partner and asked, with a pronounced Swedish accent, if she could make a suggestion. I assumed that suggestion would relate, like my first teacher’s, to the excellent opportunities for more fruitful amusement on land. Instead, she drew a picture of a surfboard in the sand and using her fingers, showed how I had had my body facing forward on the surfboard. “Go like this,” she said, turning her hand figure sideways. She added that it had looked like I was having fun out there. I left the beach feeling I’d been welcomed into a whole community of surfers all of whom were helping each other up, enjoying each other’s enjoyment. But had I been having fun? Just before my lesson, I’d received some comments on my novel from the editor I’ve been working with detailing what wasn’t working in a section I thought I’d fixed. On our way out, I kept being whacked in the face by waves, over and over again. It felt like someone was trying to tell me something. Novel writing? Surfing? But walking home that evening, barefoot, along a dirt road, between brightly painted houses decorated in Christmas lights, I felt a sense of deep bliss. Taking up surfing at age 53 (I’m now 55), has one obvious major obstacle writing does not: Age. I think of myself as being in decent shape for my age (and better shape than I’ve been most of my life), I work out with a trainer (a former marine) and I play a lot of tennis. But the crucial move in surfing, the aforementioned pop up, is particularly difficult for those beginning to be less inclined to lean over. It’s also particularly difficult for those inclined to give up. And one’s fifties are a time when one begins to do that strategically. For the most part, in one’s fifties, it makes sense to focus on refining the things you do well rather than bemoaning the things you are unlikely to get better at. (Also your hips hurt.) But there’s room for new stuff too. My weight lifting has led to small improvements on the board. Last spring, I went out with a new teacher named Justin. He was impressed with my stamina. I told Justin the “Papi this is not your wave” story and he laughed. The beach we were on, right below my mother-in-law’s friend’s house, turned out to be the aforementioned Dogman’s named, according to Justin, after a man who had lived on the beach with his dog. Before my next visit, I had a tee shirt made with a goofy looking Yankee on the back and the words, “Papi this is not your wave” on the front. I wore it the next time I went for a lesson and Justin and the Rincon Paddle Boards staff loved it. This time it was just Justin and me. Once again we went to Dogman’s. We started out by doing yoga on the beach. I stood up a few times, and kept up physically. It was Christmas again and during that visit, two little cousins pulled me aside and asked me what was apparently a very urgent question in Spanish. I stood there mutely like some six-foot robot with its mouth rusted shut. Then one of the girls looked up and asked, in the first English sentence I had ever heard her speak, “Do you have presents for us?” I decided it was time to download Duolingo. As of April, I am apparently eight percent fluent. The story is not over — on our last visit to Rincon, I went out with Justin again and stood up three times, but also spent a good deal of the session watching the Finnish veterinarian I had been paired with pop up with precision. She had been practicing the move for months and had now reached the next stage of things: carving waves. From watching her I now see more clearly how the popping up works and more importantly what it does — and am planning to add popping up practice to my workout routine. Justin was impressed with both of us. Instead of physically pushing us into the waves he chose for us, he let us go after them on our own. And together we decided I need a new t-shirt. He suggested the slogan Segunda Ola: Second Wave. Afterwards I went home, had a sandwich, drank two beers and went to sleep. I had earned it.